It was raining heavily when I left home. That’s not too bad I thought – it is bound to change; and change it did… I had to switch the wipers on at full speed! However when I arrived it did go off for about ten minutes, just enough time to get into my waterproofs. Garry Heseltine and Trevor Gibson had arrived just ahead of me and we had a bit of a blether – they had been speaking to people who had been fishing Glencorse the day before and Garry kindly gave me the information, flies, line and location that would give the best chance of catching a fish or two. I then proceeded to do exactly as he said, a DI-2 with a yellow dancer booby, size 12 on the point and a candy booby size 12 on a dropper. Stewart Barnes and I were boat partners and we decided to start about half way along the north shore and that is just what we did – and after about an hour I had a fish, the take was very gentle and for a wee while I thought I didn’t have a fish on, but it was netted and returned. Now Stewart and I have the same habit – if we see a rising fish on goes dries and we did see one or two rising fish – so on went dries. We fished over these fish until we ran past them. When we went around again the rising fish had gone! We knew that the heavy rain and cold wind that had sprung up had put them down, but the dries did not come off. All we did was to move to the west end, local to the burn. Here we saw more rising fish. After what seemed a long time, Stewart had a fish on a fly that was a cross between a hopper and a daddy, it looked about a 12 or 14. I then got one on that took a size 16 orange hog, unfortunately it headed for the boat, jumped and was gone. “Oh drat!”, said I. Then the wind got up a bit more and sleet came on… and it got colder. When we had started, the air temperature was 4.5°C and the water was 6°C, but with the wind-chill both Stewart and I had frozen hands and feet. At this stage, it had dawned on us that we were the only boat to the north of the island, indicating that the fish were being caught in boathouse bay. We decided to head in that direction. However, every time we started to move in that direction we saw a rising fish, so we stuck to dries and attempted to catch another fish that way. We did get the odd brownie or two, but no more rainbows. We did have splashes and tugs, though. About three forty-five, we finally arrived at boat bay. Some of our boats were already on the shore – and I do not blame them one bit, as it was by then bitterly cold. Stewart and I had a few drifts, but it was half-hearted stuff and we stopped for the day at four thirty. When we reached the dock, I was so cold and stiff that I was slipping about in the boat; my new shiny-soled wellies did not help. Being busy watching my feet and trying to get the battery towards the pointy end, I did not see Derek Kilgour jump into the boat, grab the battery and then jump out again. Derek then proceeded to empty the boat of our gear and by the time I had my feet working and clambered over the gunnel nothing of mine was on the beach, but I found it all behind my car. All I wanted to do was get the wellies off and some thick warm socks on. Then I loaded the car and I don’t think that I ever thanked Derek for his help – so I do it now – thank you Del, and I don’t even grudge the fact that you had fifteen fish to my one. Derek had his fish using a DI – 3 pulling black & green lures, a Kate and an orange blob – he had all of his fish either side of the island. Ivor Young and Tam Forest were fishing together. They caught fish but the most sensible thing they did all day was stop and go ashore and sit in the car with the heater on until they warmed-up, then went back out again. Wish I had thought of that! 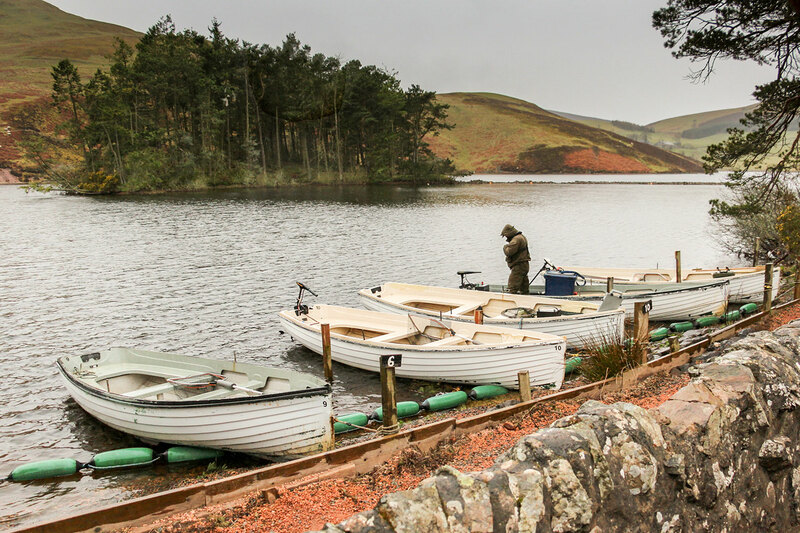 Hugh Thomson and Len Newby had fish – Hugh used a midge tip and black and green flies. Garry and Trevor had eight fish between them – both on sinking lines and boobies. Bob Whyte and Dougie Skedd had fifteen fish between them. Bob used an intermediate and got most of his fish on a black damsel. Dougie used a DI-2 and got two of his fish on a Clan Chief. The other fish were caught on horrid flies, he said. Bob Allan and Tommy Steven were fishing together and Bob netted ten fish using a DI – 3 and orange blobs. Tommy, having been instructed in the use of orange blobs by Bob, only landed nine fish. He used a DI – 3 with long steady draws. It must be noted that three of his nine fish were well over 10 pounds. One was guesstimated at over 12 pounds. The clubs 13 angler’s netted 66 fish – 6 of which were taken for the pot. With luck, we will have better weather at Carron on Saturday 18th April.